This Base Plate from Foba is a solid metal hexagon equipped with a 3/8"-16 threaded protruding screw. While officially designated for use with the Foba Superball series of ballheads, it certainly makes for an effective base with almost any ball head, geared head or pan/tilt head whenever broad, low support is needed. 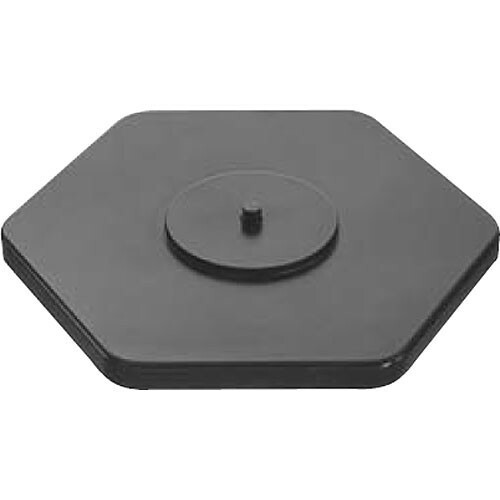 The 9" diameter hexagon plate is incredibly stable, and the base plate makes a valuable studio accessory. With a weight of 3 lb, it can also be a versatile tool in the field or when traveling. Box Dimensions (LxWxH) 10.1 x 8.9 x 1.3"
Base Plate for Tripod Heads is rated 5.0 out of 5 by 1. Rated 5 out of 5 by JOT from IF YOU NEED TO GET LOW - GET ONE I'VE HAD ONE OF THESE THINGS FOR YEARS. IT'S GREAT FOR GETTING LOW. I BOUGHT THIS ONE TO USE WITH A DIFFERENT BALL HEAD (GOT TIRED OF SWITCHING HEADS).